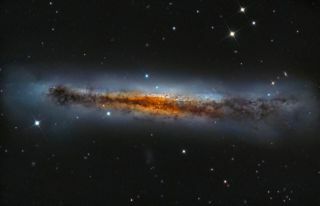 Alessandro Falesiedi captured this image of NGC 3628, also known as the Hamburger Galaxy, on April 14 to 16, 2013 just outside of Viterbo, Italy. Would you like fries with that? An avid astrophotographer ordered up one mouth-watering image of the Hamburger Galaxy in this latest night sky photo. Alessandro Falesiedi captured this image on April 14 to 16 just outside of Viterbo, Italy. Falesiedi took the photo over 10.7 hours. He used a Celestron C11 HD telescope to which direct fire at the focal of 2800 mm was placed with a monochrome CCD Starlight H694, cooled to a temperature of -15 degrees all on a single arm mount Avalon Emme Uno.